Buddy: Dude, you see that? Buddy: I can almost taste it. Lately I’m seeing birds that I worry are escaped house pets who won’t survive. Yesterday, this pretty little bird with yellow in it flew into my window twice. What if it’s a poor, freaked out, escaped house pet? Just now, an even teenier bird, with red in it, and the prettiest tweet, sat for a while on my fire escape. I’ve considered many times getting bird feeders, but every time I’ve decided against it. It would just be torturing my cats. No–they would love the birdfeeder. Kitty TV. 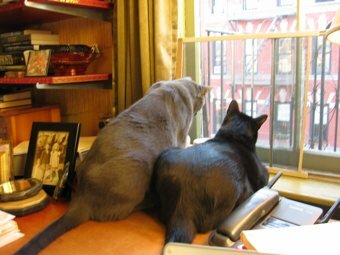 I have two cats (although the one with diabetes doesn’t get up on the window sill much) and they love watching the birds–and squirrels. Just finished Waiting for My Cats to Die. Loved your book. Want to share it with everyone I know.